Tonight I made Broccoli Cheddar Soup. It’s not a copycat recipe. It’s my own. I’ve used copycat recipes before when cooking but sometimes I feel guilty copying their recipe when I should be out buying it. (I have a low threshold for guilt.) 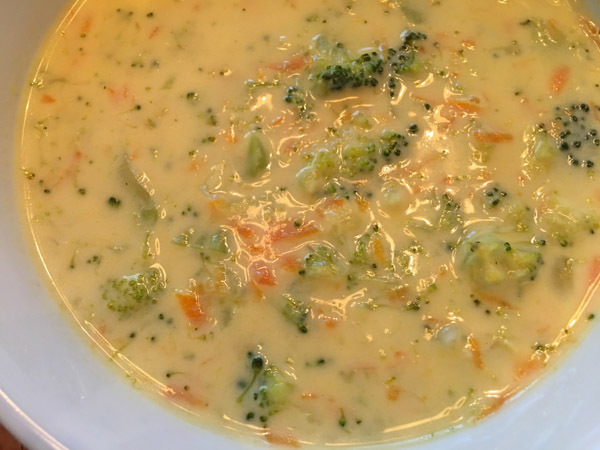 With a head of broccoli in my refrigerator, a block of cheddar cheese, some half-and-half, my obvious choice for tonight was broccoli cheddar soup. Lately, I’m finding more and more recipes for soup that I like. As of a few years ago, I rarely ate soup and I will admit I often just ate it out of a can. Yikes, but now that I’ve found some recipes that I enjoy, I have a new problem. It has become a calorie conundrum – another example of my guilt, I guess. I like the cream-based soups, but they’re high in calories. Then, unfortunately, the broth-based soups leave me hungry in an hour or two after eating them. I’m sure you can see my soupy dilemma. However, soups are easy to make and easy to take to work, so I have been juggling between varieties of soup in favor of having an easy lunch fix in the morning. Now, I’m not going to say I’m stressed or anything, but when I’m at work, every lunch pretty much needs to be a comfort lunch. 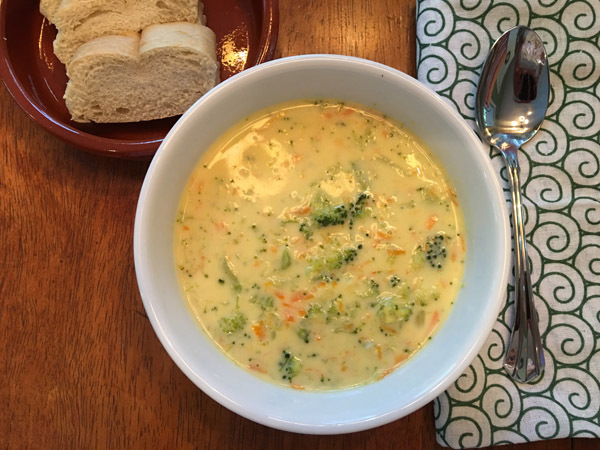 I’m hoping this Broccoli Cheddar Soup will break a nice combination of creamy comfort soup with some good-for-you vegetables thrown in. This might be my new favorite soup. My mom had an organic sweet potato that was sprouting in her pantry so she gave it to me. I love how fast they grow and its bright green color. 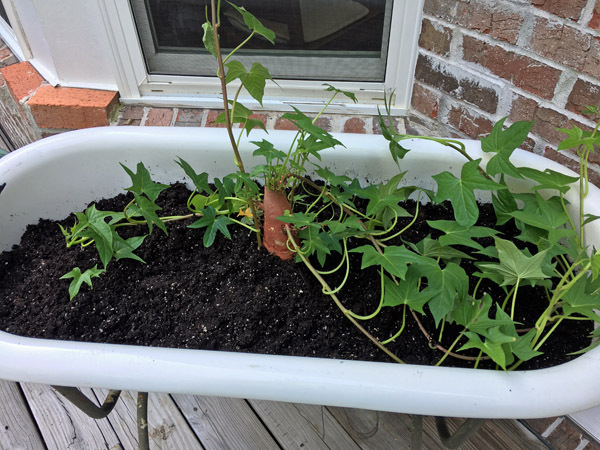 I put it outside but it will probably frost before I get any sweet potatoes but maybe I can bring it inside for the colder days. Last winter it didn’t get very cold at all so it could have stayed outside. You never know what this winter holds. As you can see from my vertical potato planting position, I’m not particularly a gardener. 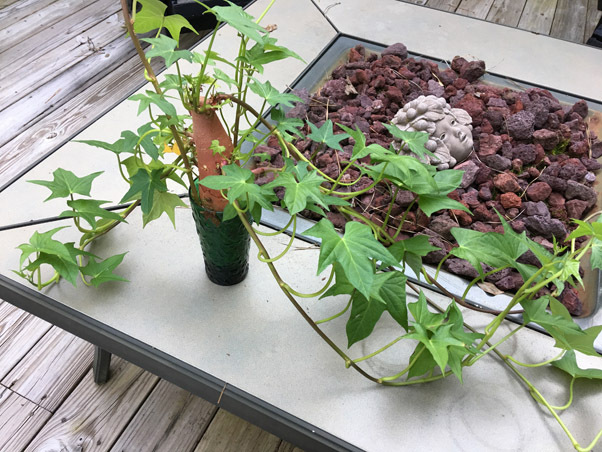 I probably better supplement my gardening skills with some cans of sweet potatoes and cans of everything else. I go through stages of wanting to live on a farm and be self-sufficient and then knowing that I’ll never be self-sufficient, just lonely out in the middle of nowhere with a bunch of radishes or something else easy to grow. Life is a conundrum, isn’t it? Just like my calorie intake. We make oh-so-many decisions every day, don’t we? 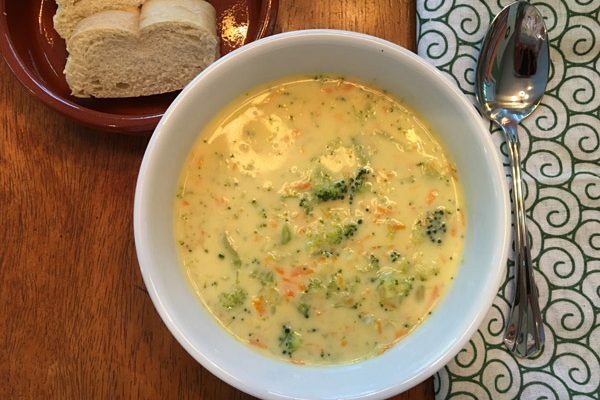 Make some Broccoli Cheddar Soup tonight. Relax, exhale, and enjoy a peaceful meal. Just tasty food and a good friend or a good movie. There you go. I took one decision off your plate. Melt butter in a stock pot and cook the onion until soft; add the broccoli and carrots. Cook twenty minutes over medium or low heat being careful not to burn. Sprinkle the flour over the vegetables and stir to blend. Cook five minutes more. Pour in the chicken broth and heat through. 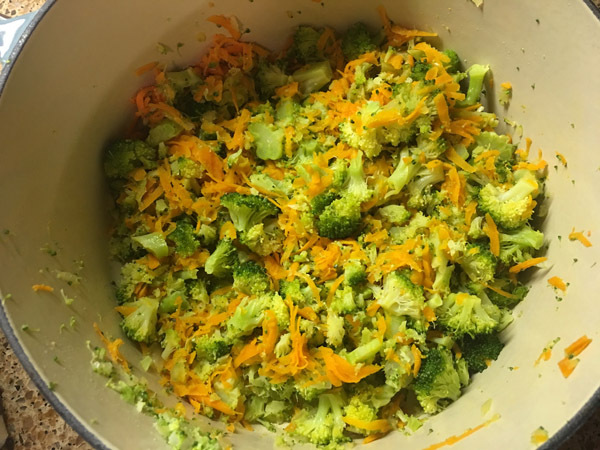 Slowly sprinkle the cheddar cheese into the broccoli mixture stirring constantly. Add the milk and half-and-half. Heat through but do not boil. Cook your vegetables with the butter until tender. Be sure to grate your cheese finely for best results for melting. 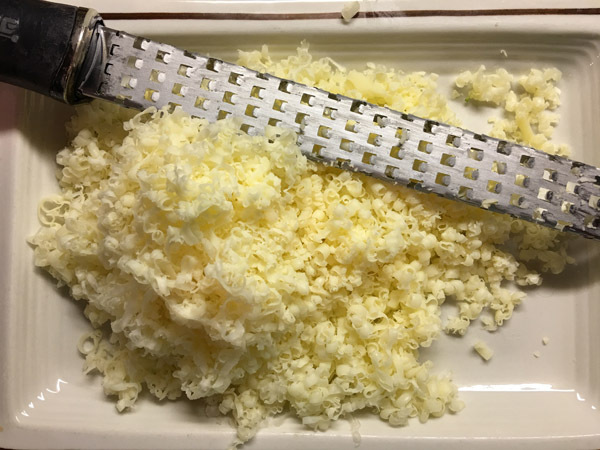 Also consider that the commercially shredded cheeses use fillers, so I try to stay away from them. Tonight, I used extra sharp Cabot Cheddar. It was a little strong but I still liked it in the recipe although a nice mild cheddar would hit the spot, too.